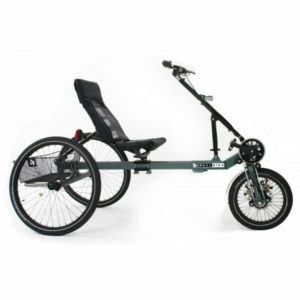 The EasyLegs Pro is a conventional tricycle that only trains the legs. It can be used by people with and without physical disabilities. The product was developed to provide more stability than the average tricycle. The EasyLegs Pro can be equipped with an electric pedal support. We offer a range of accessories that allow the user to adapt the tricycles further to completely meet your personal needs. 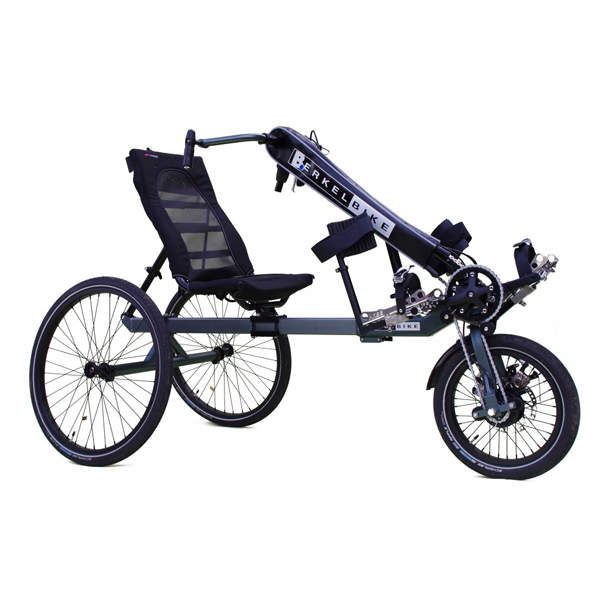 The EasyLegs Pro, unlike most tricycles, can be completely adapted to your posture and environment. The EasyLegs can be customised in length and width to suit the user’s physique and environment. For example, if you have a narrow front door, then we can adjust the width of the bike so that it can easily move through the door. The seat height is adjustable and the EasyLegs backrest can be adjusted according to the user’s posture. Our goal is to make sure the user can sit comfortably at all times, even if with limited mobility in the hips. The EasyLegs Pro can be equipped with electric pedal support and can also be used by people with reduced leg function. At the same time, it offers the same comfort and ease of use as a conventional scooter. The EasyLegs Pro helps the user remain fit by offering the possibility of regular movement. “I’m Mieke van de Louw. Three years ago, in the beautiful month of May, something happened that nobody could be prepared for- I suffered a stroke. A stroke with left-sided paralysis, which suddenly prevented me from walking. During my rehabilitation, it became clear that I would not recover again. And so I had to make a choice: a scooter or a tricycle. Due to high-level paraplegia (C3/4), Luke Chamberlayne was left with little strength and control in his legs. With his severe handicap, he never expected to be able to ride a bicycle again. Thanks to clever adjustments – like special gloves, the main brake and a smart pedal support – we’ve been succeeded making Luke cycle again with the Easylegs Pro. With great pleasure, he now cycles every week three to four times. Check out his story below. 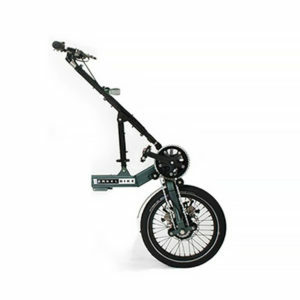 The EasyLegs with electric pedal support offers the best of both worlds; It combines the convenience of a scooter with the exercise offered by a regular bike. Even if the user has difficulties completing a full cycling motion, the pedal support can help out whenever necessary. Just like the accelerator of a scooter, the EasyLegs has a lever to control the electric pedal support. With this lever, the user can decide how much assistance is required for pedalling. The user can choose how much work they want to put in; they can choose to cycle completely by themselves or leave it completely over to the pedal assist, or anything in between. Whereas a conventional engine drives the wheels directly, the EasyLegs pedal assist is connected to the lower lever that moves the pedals. This means that even if the support is put on a max, the legs get a workout by going through the pedaling movement. This is the biggest advantage of a supporting engine compared to the engine of an e-bike. The pedalling assist system is placed subtly so that it appears non-existent to outsiders. The pedaling movement appears natural, even with the pedal support. The EasyLegs is more than just another option; it’s a healthy alternative to the scooter. THE EASYLEGS PRO OR THE EASYLEGS CONNECT? The EasyLegs tricycles are available in two versions: the Pro and the Connect. 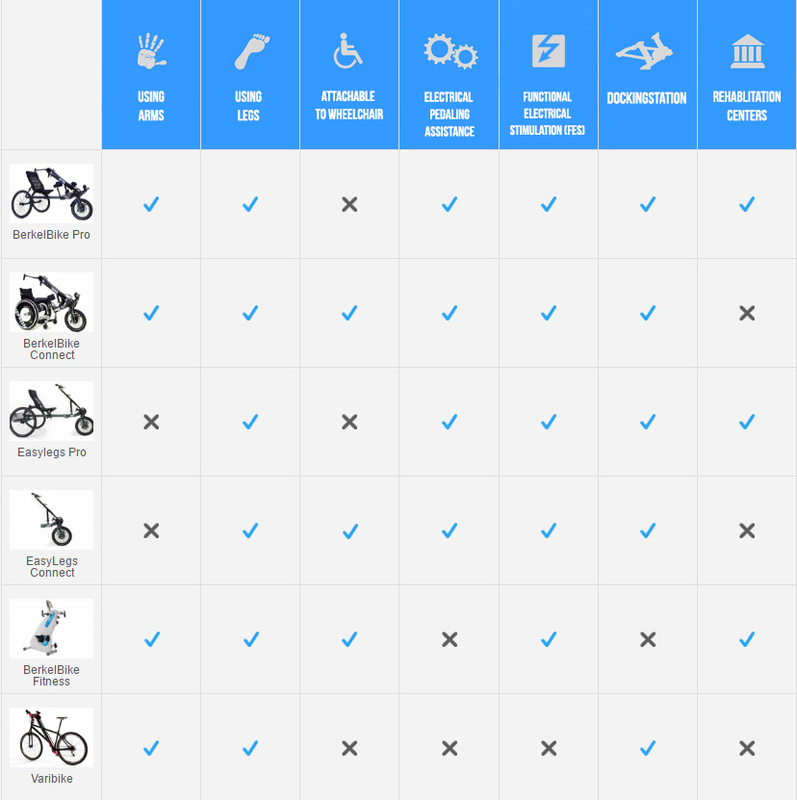 The Pro is comparable to a three-wheel recumbent, while the Connect is a single-wheel extension bicycle that can be connected to a wheelchair and transformed it into a full tricycle. The Pro was developed to cycle long distances at high speed. The bicycle is light and provides little resistance during cycling. The wide wheelbase with a 9 degree frame curve provides extra stability. The seat height can easily be adjusted to the driver: high for a good overview or low for better stability. Especially with the seating area at a low position, it is possible to take turns at high speed without tilting. The seat position can be quickly adjusted without tools. Even people with little mobility in the hips or people with overweight can sit comfortably by tilting the backrest downwards. It is also possible to adjust the rear axle position, depending on your personal preference. Positioning the rear axle rearwardly results in greater pressure on the front wheel, making it less slippery and allowing you to safely cycle uphill. Positioning the rear axle more towards the front, reduces the turning circle of the bicycle and provides easier maneuverability in the city. Photo: EasyLegs PRO (Left) and EasyLegs Connect (Right). The Connect has been developed for use in combination with your wheelchair. The greatest advantage is that you don’t have to transfer from your wheelchair to the bike. This renders the Connect especially convenient for social and daily activities such as shopping, visiting friends and taking a ride in the park. The Connect is smaller than the Pro and therefore even easier to carry in the car or store at your home. If you already have a regular hand bike that can be connected to your wheelchair, it is usually possible to link the Connect in the same way. You do not need to buy a new bike if you want to use the Pro instead of the Connect or vice versa. If you have already purchased the Connect, you only need to purchase the back part of the Pro. If you already have the Pro, you only need to purchase the connector to link the front part of the Pro to your wheelchair. If you want both, you can buy the Connect together with the back part of the Pro. You can then transform the Connect into the Pro without the need of any tools.